This week’s “And So To Sew”, and “And So To Embroider” bulletins really kick off into some great projects. 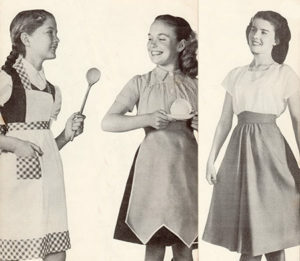 And So To Sew bulletin 3 includes full patterns and instructions for two aprons, plus a dirndl skirt with shaped or straight waistband. While And So To Embroider 3b (aka And So To Sew Embroidery Section 3b) teaches us to embroider them, and a cushion, with interesting spot motifs. It also introduces a new range of embroidery stitches. As always with these leaflets, I have included links to video and photo tutorials for each technique or stitch, so as many people as possible can get the most out each week. 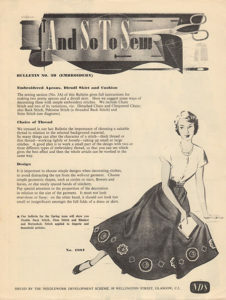 I am so enjoying the ‘And so to sew leaflets’, as I said in my first comment they are a walk down memory lane for me. We used them at the trade school I went to in1951.